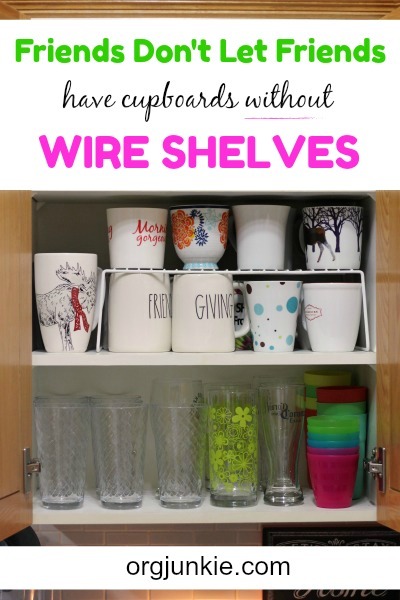 Friends Don't Let Friends Have Cupboards Without Wire Shelves! Friends Don’t Let Friends Have Cupboards Without Wire Shelves! Happy Friday y’all! I think of you all as friends so it only feels right that I share something important with you today. I wouldn’t let you go around with spinach in your teeth and so I absolutely cannot let you go one more day without wire shelves in your cupboards. I’ve got your back girl. 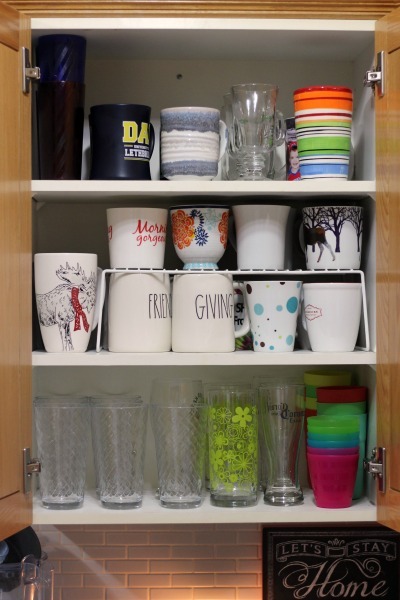 This past week I updated my coffee cup cupboard and that’s what prompted today’s post. I made a pretty small tweak in this cupboard but the result was a pretty big improvement for such little time and dollar investment. My kind of organizing win for sure! To me what organization is really about is the cumulative efforts of small organizing tweaks to solve annoying messy problems. 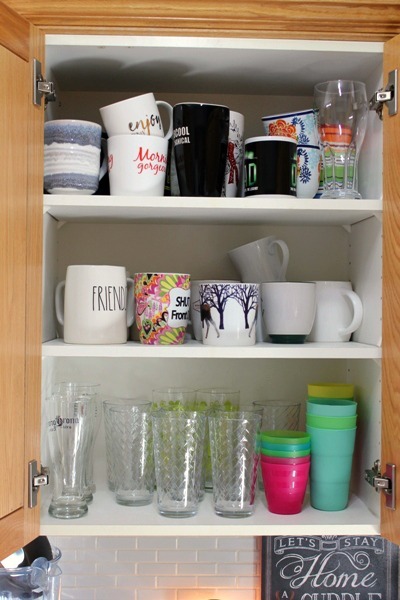 One of my annoying problems was with all our coffee mugs. We found ourselves stacking the mugs and every day I was sure one was going to come tumbling out on to my head. Yes the obvious solution would be to purge some of the mugs as that would easily solve the problem. And you know I’ve been known to purge a few things from time to time, ha! If I had no other choice, I most definitely would have purged to make it fit however this time I didn’t want to. My mugs make me happy and if I could make it work then I didn’t need to worry about letting any go. See I’m not always about just getting rid of things! However for the things we want to keep, we do have to find the space. And in my mug case, I needed a safe space where mugs weren’t ready to fall to their demise every time I opened the cupboard. Thankfully all it took was one inexpensive wire shelf to double my storage space with very little effort. Here’s a “kind of” before picture. 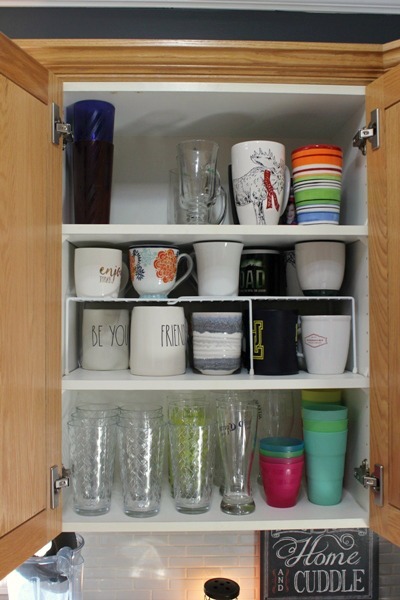 Some of the mugs were in the dishwasher but picture more mugs stacked up together on the middle shelf. You get the idea. To find a shelf I walked my house and pulled the one I was using in my pantry. 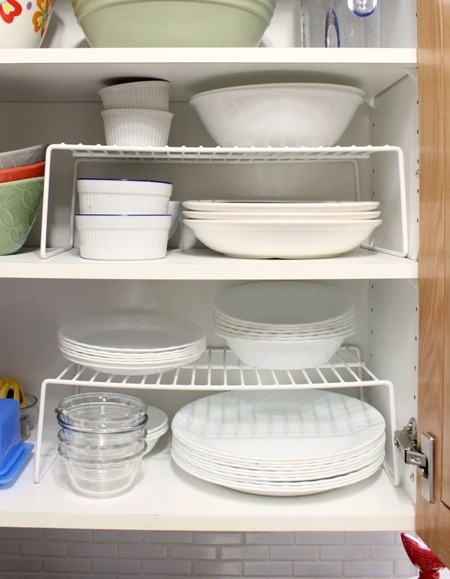 It’s an adjustable shelf so as you can see it fit the entire width of the cupboard. I didn’t love this fit though. My husband has two favorite mugs that are tall and I wanted them in easy reach on the middle shelf. So I walked my house again until I found another wire shelf in my bathroom cupboard (I seriously have them everywhere!) to use. And I liked this one much better for us. Also to make this all work I had to lower the middle shelf down a notch in my cupboard. So much better! Have no idea why I didn’t think to do this sooner. A quick fix with a simple product that doubles the space. Wire shelves can be used in so many areas, in so many rooms. Here are some other areas in my kitchen that I use beautiful wire shelving. So if by chance you do not currently have wire shelves in your cupboard, I highly recommend you add one or four. You can find them in most stores including the dollar store or on Amazon HERE (affiliate link). Now I’m I’d better be off to reorganize my bathroom cupboard. If you already use wire shelves in your home, how do you use them? 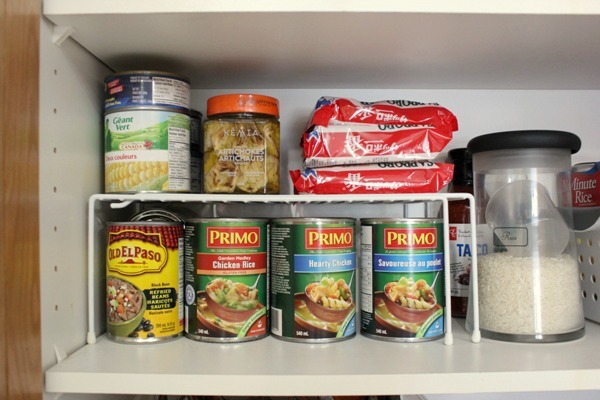 4 Responses to Friends Don’t Let Friends Have Cupboards Without Wire Shelves! I use wire shelves in my kitchen cabinets too—I love dishes & related, so they are necessary to easily access my large collection. But I also found them necessary to display my kids special Lego builds. There is only so much space in the bookshelf, and it was great to double it with wire shelves for those Star Wars sets my kids don’t play with anymore.